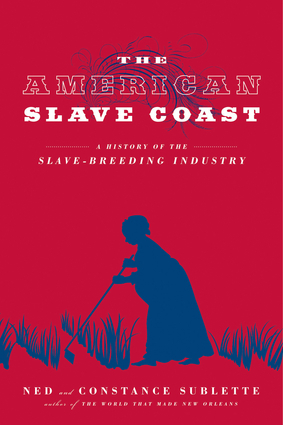 The American Slave Coast tells the horrific, far-reaching story of how the slavery business made the reproductive labor of the people it referred to as “breeding women” essential to the expansion of the nation. Amercan slaves were not only labor, but merchandise and collateral all at once. In a land without silver, gold, or trustworthy paper money, their children and their children’s children into perpetuity were human savings accounts that functioned as the basis of money and credit, paying interest to slaveowners in the form of newborns. The collision course of Virginia, the “mother of slavery,” versus South Carolina, the great slave importer, supplied part of the drama of the Constitutional Convention and climaxed in the debacle of the Confederacy. 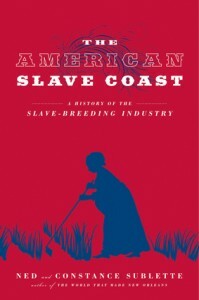 Thomas Jefferson’s prohibition of the African slave trade as of 1808 was not a humanitarian action but instead protected his slave-breeding Virginia constituents—more slave ships came to New Orleans from the East Coast of the United States than from Africa.The American Slave Coast is an alternative political, cultural, and economic history of the United States that shows how the slavery business set the agenda of the colonies and the nation, presenting even the most familiar historical figures and events in a revealing new light. Ned Sublette is the author of Cuba and Its Music, The World that Made New Orleans, and The Year Before the Flood. Constance Sublette published, as Constance Ash, the novels The Horsegirl, The Stalking Horse, and The Stallion Queen, and edited an anthology of science fiction. They live in New York City.